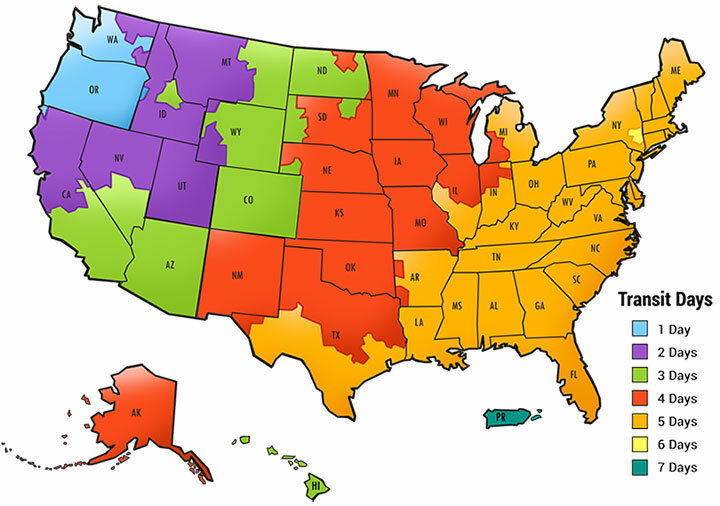 Shipping Transit Time Map for U.S.
We ship worldwide! In fact, we can ship our products to virtually any address in the world. However, there are a few limitations on some products as they cannot be shipped to international destinations. Please give us a call if you have any concerns about a potential limitation. When your order is being placed, we estimate the shipping and delivery dates based on both the availability of the items purchased and the specific shipping options you choose. Our most utilized transit providers are UPS and FedEx, however, in some cases very large items are shipped freight. If you have and questions or concerns regarding the shipment of our products, please give us a call to talk with one of our helpful representatives. Our representatives can assist with information regarding area shipping costs and common transit times. Most orders placed before 1:30pm PST ship the same day. Some restrictions apply. We do accept returns on most items. However, the items must be new, unopened and received back at Creative Safety Supply within 30 days of the initial purchase. We try our best to process all returns quickly and efficiently. Once you send the product back to us, you can expect to receive your refund within four weeks at the latest. However, please keep in mind that in many cases you will receive your refund much sooner. This time period includes the transit time for us to receive your return from the shipper (up to 5 business days), the time it takes for us to process your return (3-5 business days), and the time it takes your bank to process our refund request (5-10 business days –depending upon your bank). If you have received a product that you would like to return, the process to return is simple! Please call customer service at 1-866-777-1360 to setup a return authorization and receive an RMA # before shipping your item(s) back to us. We will also keep you informed on the status of your return. We do this by notifying you via e-mail regarding your refund once we’ve received and processed the returned item.